The Handy Library Editions series was published by Little, Brown & Co. from at least 1903 until the mid-1920s. A few volumes appear with a Phoenix Book Co. (London) imprint (suggesting the series may have been co-published in the UK). 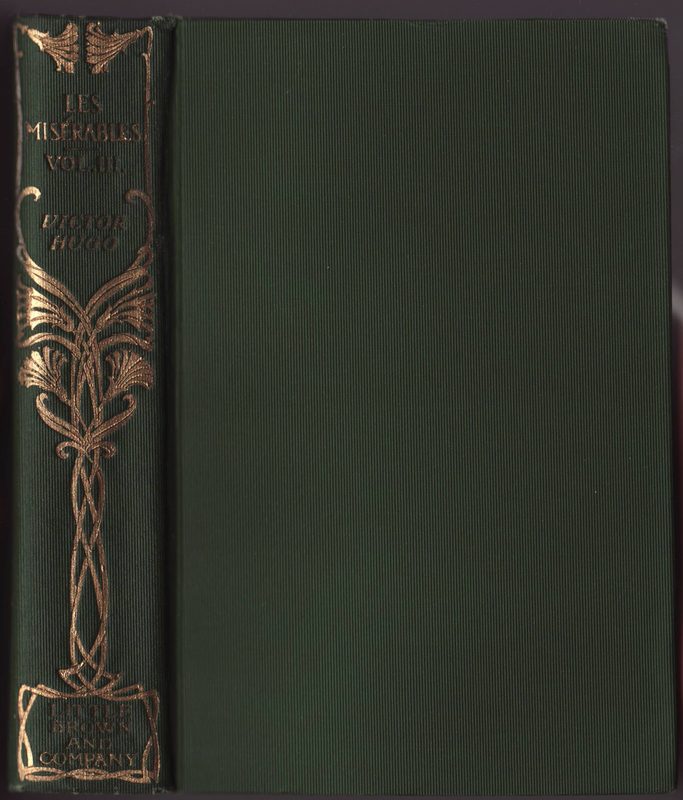 The series was a combination of an author’s “collected works” as well as reprint series. It could be marketed to people as a series, or as the collected works of a particular author (if they only wanted those volumes). Jackets are common to the series, relatively plain, text-only design. 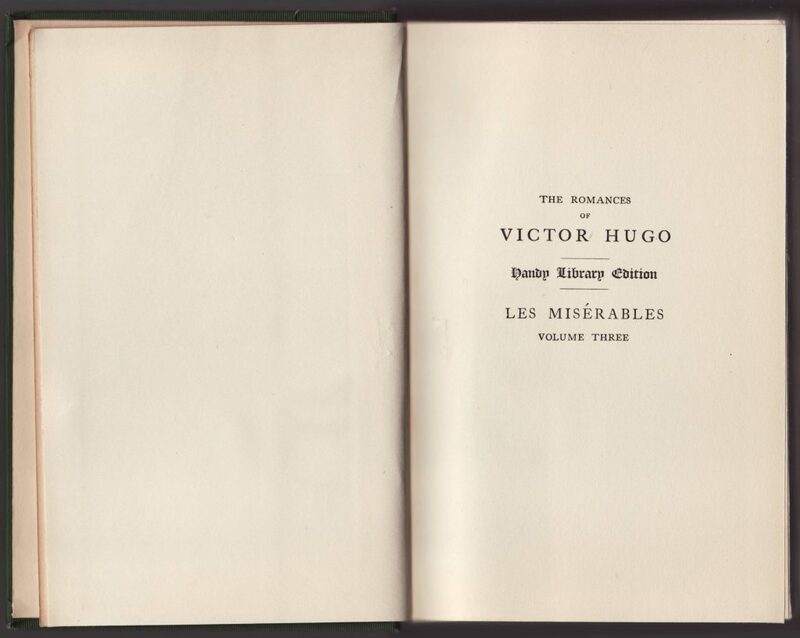 The spine includes the author’s name (Victor Hugo) and the series name along with the book title (Les Miserables) and volume (4, in this case). Longer novels, such as this one, are spread over multiple volumes (in this case, five) in the series. 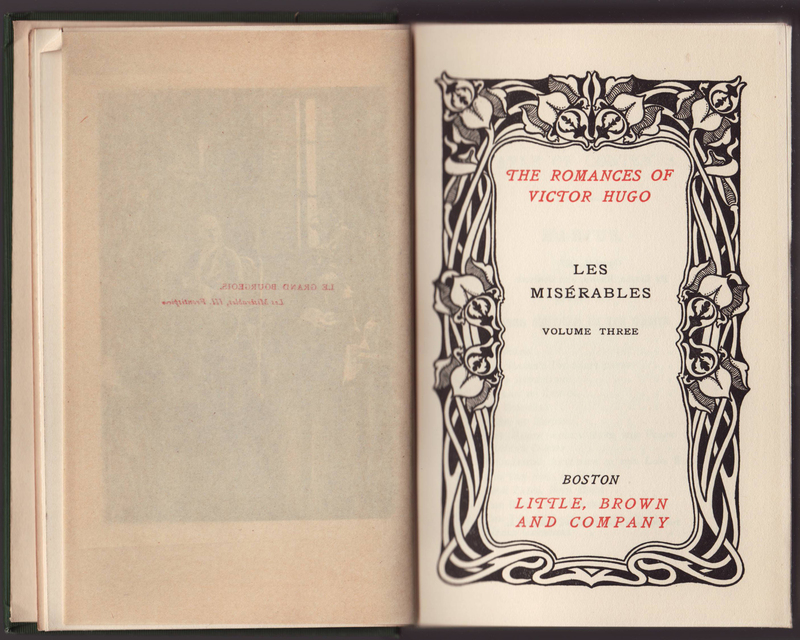 A faint stamp on the jacket spine indicates “FIVE VOLS $5.00 NET.” The front of the jacket advertises “The Romances of Victor Hugo” of which the five-volume Les Miserables is one of fourteen volumes. The other Hugo titles are listed (with the number of volumes for each title). 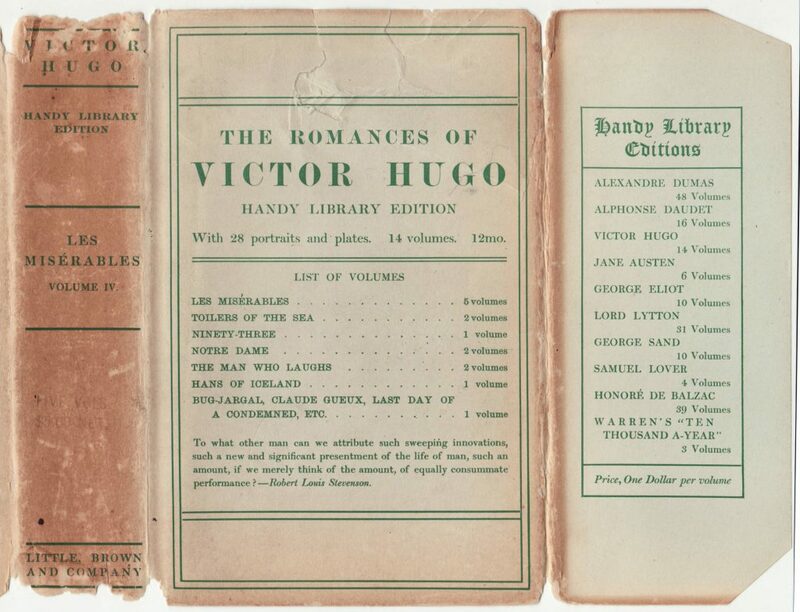 The front jacket spine lists the 14 Hugo volumes along with other authors in the Handy Library Editions series, more or less “collected works” of various authors. 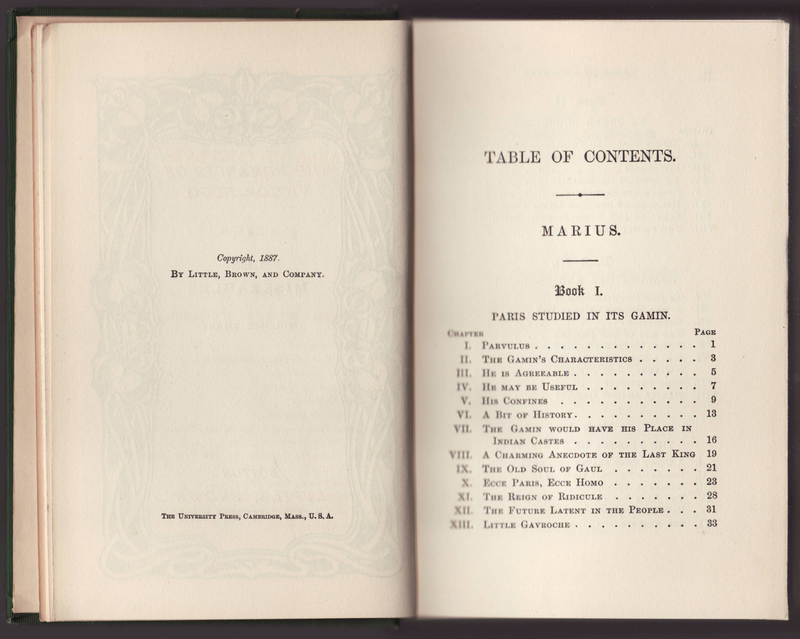 In 1908 the price per volume was increased to $1, so this book was published in or after 1908 (the only other date in the book is the copyright date of 1887). 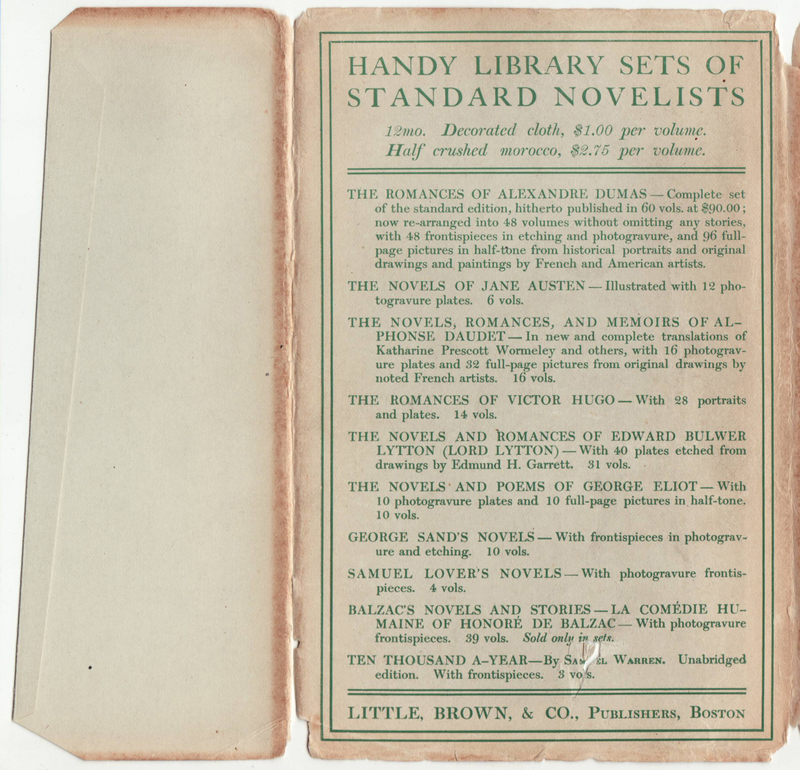 The rear of the jacket advertises the “Handy Library Sets of Standard Novelists” in cloth at $1 per volume and half crushed morocco at $2.75 per volume. The authors listed on the front flap are listed with details about the sets and illustrators. Green cloth bindings with gold, arts and crafts designs on the spine. The half title with the series name. 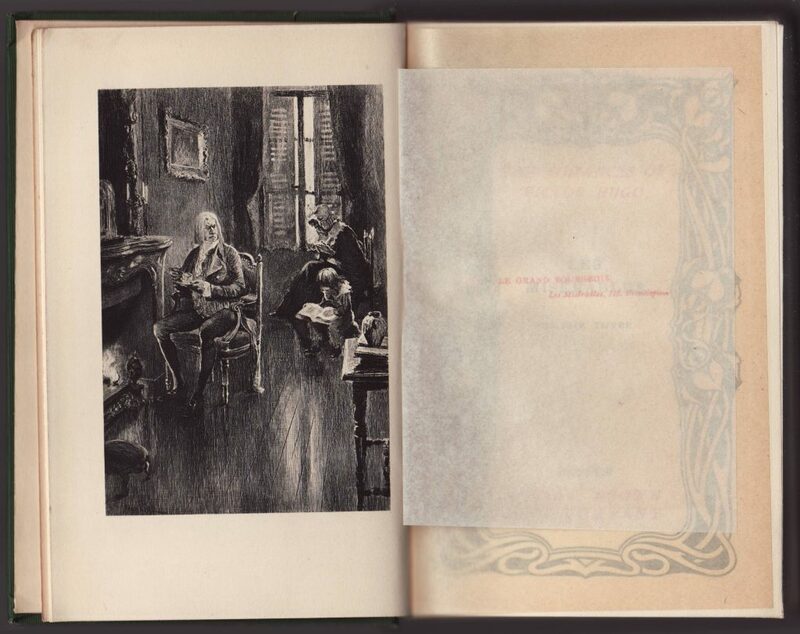 The illustrated frontispiece has a small piece of tissue covering it, lightly glued to the side of the illustration. A full-page sized tissue sheet bound into the book has, printed in red, a title for the frontispiece illustration. 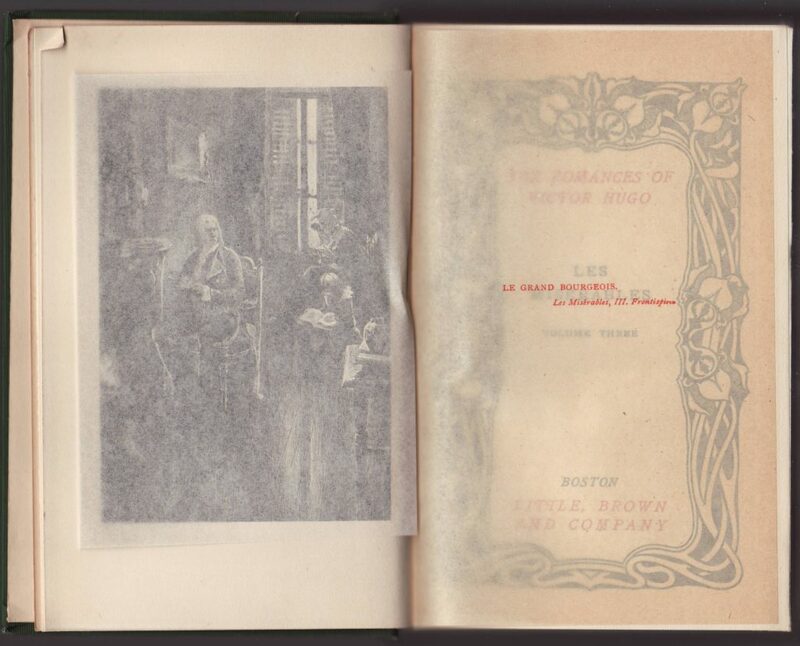 The copyright page indicates 1887, but this book is from after 1908. The book was printed by the University Press, Cambridge, Mass, USA.